Tween Tuesday is a weekly meme to highlight great reads for tweens. Add your own Tween Tuesday post in the Mister Linky below! About the Book: (From Goodreads): Bro-jitsu is a highly stylized form of physical and mental combat that has been practiced and honed to perfection over countless millennia by billions of human beings who all have one crucial thing in common: annoying siblings. The book breaks down Bro-jitsu into three strategies: offensive moves, defensive moves, and psychological manipulation. Each section delivers step-by-step instructions on performing crucial techniques, from the classic Wet Willy to the inventive Full-Body Defensive Fish Wiggle. No sibling should be without it! GreenBeanTeenQueen Says: I'm somewhat mixed on this book. 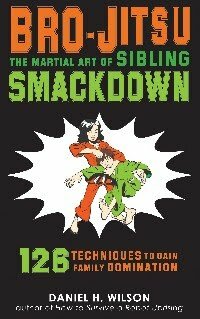 After reading Bro-Jitsu, I was reminded of the many things my siblings and I would do to torture each other. There were moves that made me chuckle-pillow fights, couch wars, tying sleeves together to trap arms, and putting bugs on your sister-my brother still does that to me! There's the gross-out moves-farting, spit, burping, and dog poop. There's the psychological-looming, lick the floor, "uncle." This book covers them all. I think middle school boys would love this book. It's presented in a very humorous way, it's a quick read and there are lots of illustrations (my copy was in black and white, but the final book will be full color, which will really make the illustrations stand out). But some of the moves could possibly do harm-maybe Im just a cranky old person and am seeing things from an adult perspective instead of a tweens. There are some cautions given about some of potentially dangerous moves, but the whole tone of the book is pretty light, I'm not sure how serious those would be taken by some readers. I think most readers would get a kick out of Bro-Jitsu and most likely have already tried many of the moves that are listed. It's a book that I don't know who the target audience really is though. I think it has high tween appeal, but I could also see college students laughing over it remembering their own sibing fights. It strikes me as a gift book-you know the ones that have a niche market that sit on the front table of the bookstore around the holidays. I would give this to a reader who wouldn't take it too seriously but would also find the humor in the subject and enjoy a good laugh (and maybe a new way to annoy a sibling). Ha! Never heard of this one, but sounds like a great tween boy and probably college boy read :) Good call on that. Think I now have a Christmas present for my brother!